Virat Kohli's unbeaten 43-run knock helped India score 110/5 at stumps on the third day. 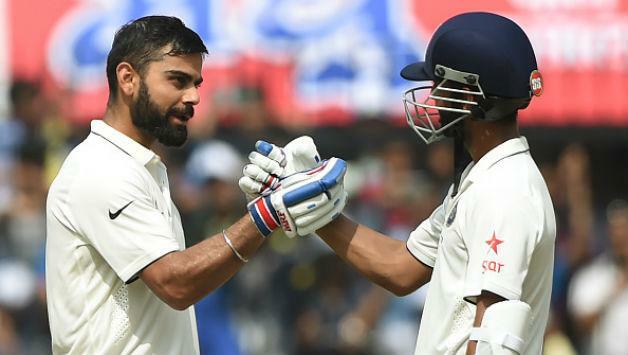 Skipper Virat Kohli's unbeaten 43-run knock helped India score 110/5 at stumps on the third day of the first Test against England here on Friday. India need another 84 runs to win. After bowling out the hosts for 180 in their second innings at tea, Indian batters once again failed in the second innings as apart from Kohli, no other batsmen stood up to the occasion and went back cheaply.Kohli and Dinesh Karthik (18) were at the crease when umpires dislodged the bails for the day. 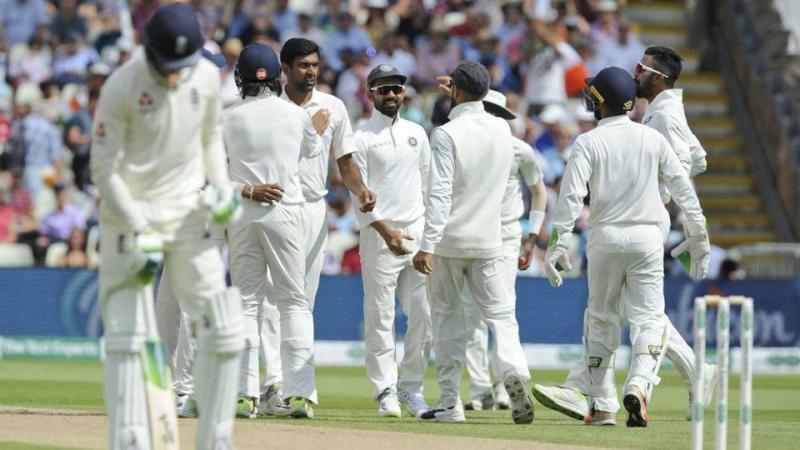 India's star off-spinner Ravichandran Ashwin, who dismissed former skipper Alastair Cook for a duck on Thursday evening to leave the hosts reeling at 9/1, started off the proceedings on Friday and immediately succeeded in packing back an in-form Jennings, caught beautifully by Lokesh Rahul at second slip.Struggling at 18/2, Root along with new man Malan played out Ashwin watchfully but the offie constantly kept asking questions before prevailing over the English captain. Root fell while trying to pull Ashwin only to find the ball landing in the safe hands of Rahul at leg slip before Ishant joined the party in rocking the English line-up.The lanky Delhi pacer first dismissed Malan caught by Ajinkya Rahane, before packing Bairstow and Stokes within a span of three balls.While Bairstow fell to the safe hands of Shikhar Dhawan at second slip, one ball later Stokes was brilliantly caught by skipper Virat Kohli at third slip as England started looking down the barrel at the break and could only manage to swell their second innings lead to 99 runs at lunch. The second session saw England only managing to add another 74 runs, thanks to Sam Curran's sensational 63 off 65 deliveries, even as pacer Ishant Sharma (5/51) continued with his fine rhythm to trouble the lower batting order of the hosts.England lost Jos Buttler (1) in the second ball of the session. 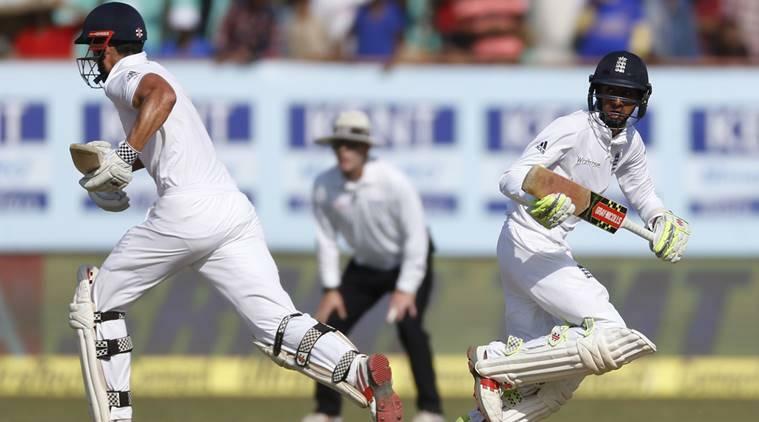 The right-handed batsman couldn't handle a delivery from Ishant Sharma, who picked his fourth wicket. Buttler provided a thin top edge which went to the hands of wicket-keeper Dinesh Karthik.Afterwards, 20-year-old Curran and Adil Rashid (16) tried their best in a 48-run stand for the eighth wicket. Paceman Umesh Yadav rattled the stumps of Rashid, who survived 40 deliveries.Curran stood out as he took the attack to the opposition bowlers by going after them. He was not even afraid of off-spinner Ravichandran Ashwin, whose venomous spin fell the top three English batsmen. Then, Curran's innings ended when he cut off a short and wide delivery from Umesh that went into the hands of Karthik, brining an end to the second innings of England, who have a 13-run lead after posting 287. The success came in the sixth over when India's Murali Vijay (6) was dismissed by pacer Stuart Broad. In the very next over Shikhar Dhawan (13) was also sent packing by Broad. The scoreboard was reading 78/5 when Karthik joined hands with Kohli. The duo played sensibly and helped India end the day's play without losing anymore wickets.